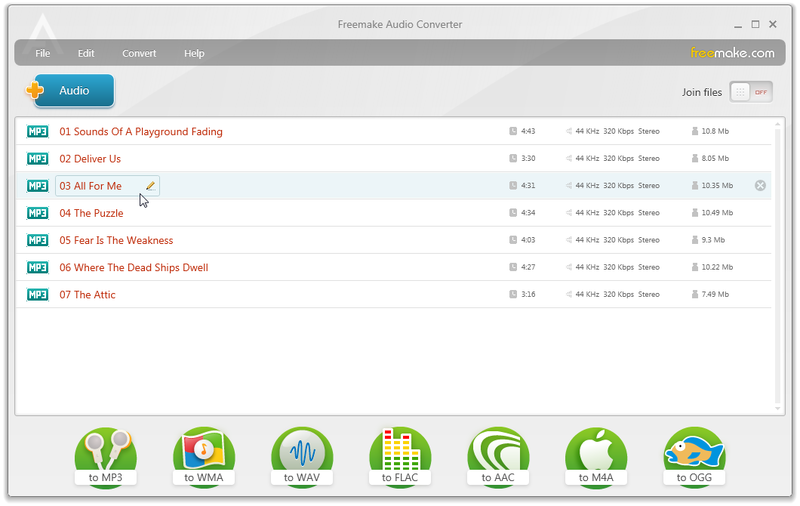 Freemake Audio Converter is a new free tool that converts audio files between all key audio formats and prepares music for MP3 players, mobile phones and Apple gadgets. It accepts over 40 audio file formats (MP3, WMA, WAV, FLAC, AAC, M4A, OGG, AMR, AC3, AIFF, M4R) and makes it possible to listen to almost any audio in iPod, Zune, Coby, SanDisc and many others. The free audio program converts music to M4A audio format preparing files for Apple devices - iPad, iPhone, iPod. For more convenience it also exports converted audio files directly to iTunes library. For each of the supported audio formats Freemake Audio Converter has several pre-defined presets. The powerful users can create a custom preset with the adjustment of bitrate, audio channels and sample rate of the output audio. For those who would like to convert multiple audio files simultaneously, the audio converter provides the batch mode option. Also, the freeware allows users to join audio files into one and convert it to any of the supported output formats.